Home FleetWatch 2011 How tight will the purse strings be? How tight will the purse strings be? After a bumpy 2009 and 2010, how do financiers view prospects for 2011 and what should fleet owners and transport operators expect when applying for finance to acquire their trucks? 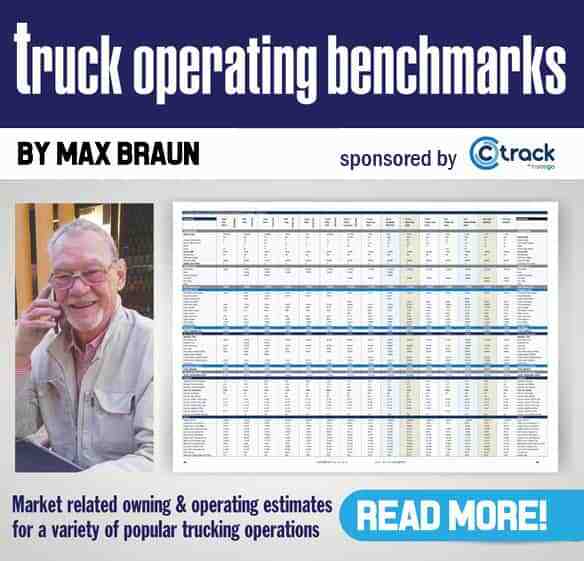 In this article, FleetWatch special correspondent Max Braun talks to a number of financiers, OEMs and others involved in the financing and selling of new and used trucks to get a handle on the thinking out there. Financing new and used vehicles is a critical factor for most of the diverse road transport industry, this especially so as fleet owners and operators of all sizes and market segments strive to replace vehicles which are now well past their sell by date. They may also need to acquire additional vehicles to cope with recovering economic activity especially in freight logistics, agriculture and the soon to be revived construction industry. Hopefully, we will now see financiers progressively releasing their bulging purse strings fast enough to stimulate and sustain the increasing sale of commercial vehicles that became clearly evident when the NAAMSA statistics for January and February 2011 were released. Comments from several vehicle manufacturers (OEMs) confirm that the demand for truck-tractors and trailers is gaining in strength mainly as replacements and to a lesser extent, rigid trucks mainly as additions to fleets. Naturally, the perception of the market varies with each OEM’s current range and model variations. The delay in replacing vehicles from 2009 into 2010 flowed from the insistence on the part of various financiers that leasing and other agreements be extended rather than granting credit to fund new vehicle replacements during that period. This was not a conscious decision by some financiers. “A number of operators that we would have liked to finance simply decided to hang ten with replacements given the market conditions and the resultant impact on their cash flows,’ comments Elmarie Smith of MAN Finance. Looking back on the negative impact this had on fleet owners and operators’ cash flows and balance sheets, it is not surprising that so many went belly up or were forced to sell their fleets or businesses for what they could get for them under stressed economic conditions. Rolling back vehicle replacements results in huge unbudgeted maintenance and repair costs and loss of vehicle availability to do the work. Many of those that survived were left with compromised balance sheets, leaving them with little chance of their applications for credit succeeding. When this unfortunate failed business model was applied during the recession, it followed hard on the heels of the period of lax credit approvals and unwarranted incentives that were granted by financiers seeking to improve market shares in the business of financing employed assets. But let’s not forget that as a result of the arrear and bad debt situation at the time, this came about as a result of operators and companies losing contracts especially in the resources sector, which then made it more difficult for them to obtain finance. Let’s hope that in future such errors of judgement can be avoided by the key financial services community gaining a better understanding of the fundamentals of vehicle replacement and selection. This is vitally important as South Africa moves towards achieving better levels of transport efficiency and a smaller carbon foot print – both essential elements if road transport is to play its part in providing the economy with on-going cost improvements and customer satisfaction. So how do financiers view the truck market for 2011? What can fleet owners, operators, SME’s and owner-drivers expect when applying for funds to replace or acquire new or used vehicles? Financiers are, at this time, concentrating on their existing clients. “If they have a current account with a particular bank they are more likely to gain approval on more favourable conditions,’ says Raymond Schulz, marketing manager at UD Trucks. Agreeing with Schulz’s comments, head of Transport Solutions at Standard Bank, Kathy Bell says: “Fleet owners are moving away from brokers to establish a direct relationship with the financier of their choice’. This enables them to plan their capital expenditure budgets and secure a sustainable vehicle replacement plan for the future. “Due largely to the still high number of transport operators that are failing, credit approvals have not yet eased up as much as the industry expected,’ says Elmarie Smith at MAN Finance. All the contributors to this overview of vehicle financing trends and developments confirmed that the hard lessons learned from the dark days of the recent economic recession have resulted in a virtual overall reduction in the duration of leasing and other vehicle financing alternatives. Depending on the transport task, agreements are now set to either 36 or 48 months. Only exceptional cases – when assessed on merit – can expect to secure funds over a 60 month period. Derek Gerber, managing director of Fast Forward Finance, says 60 months is considered only in exceptional cases where the use of the equipment can be seen to lead to a longer useful life of the assets. Now that residual values are out of favour, Gerber informs us that residuals have never been popular with the banking fraternity. This is not surprising because bankers have little tolerance for downside risk. However, Gerber reminds us that FML providers offer residual value operating leases but usually when there is a satisfactory buy-back arrangement with the OEM. Operators making use of short term finance can expect to pay a deposit, even if it is a financial lease. Financiers have decided there is no free lunch. As in the case of acquiring other assets, the purchaser must have some equity in the asset. The size of the deposit depends on the merit of each individual application for credit. There is no industry trend for this item. Deposits can be avoided and residuals can be included when operators want to use vehicles rather than ultimately own them. This method of financing is an extended rental agreement or better known as an operating lease , with or without a maintenance contract for the duration of the agreement. Under these agreements, the lessee is not responsible for claiming the depreciation or the ultimate resale value when the vehicle is finally sold. However, lessees are always liable for any shortfall of the residual value – if there is one – that might arise as a result of abuse, accident or incidents. UD Trucks’ Schulz complements the view that the finance industry serving truck owners changed its business model as various intermediary channels and alliances with OEMS were terminated. “It would be interesting to see current market shares of the various banks participating in asset financing as a result of those changes,’ ponders Schulz. Many of the large blue chip fleets, whether for reward or own transport, have a sensible vehicle replacement plan in place and generally pay cash for their vehicles. Vehicles are replaced around 36 months and frequently have an acceptable buy-back arrangement with the supplying OEM. Following this path provides an operating framework to ensure a means to predict and control maintenance costs, avoid the need to repair or replace any of the major components and at the same time, reduce the input of additional capital to manageable amounts when upgrading the fleet. Collectively, this approach holds the potential to optimise total transport operating costs, vehicle availability and hard to beat customer service. (Watch out for “Vehicle Replacement in Perspective’, a new FleetWatch book partnered by UD Trucks to be released shortly). With the low cost of entry into the business of trucking, the road transport business has traditionally attracted entrepreneurs. 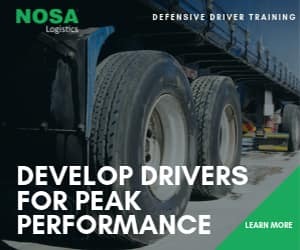 Considering the quick deliverables trucking offers, it grabs the imagination of those eager to become transport operators, sub-contractors or ownerdrivers , a chance to be in business for themselves. Two industry Charters have been established and to some extent implemented. Government has made it clear that it wants to see rapid transformation of the industry via the BBBEE Road Freight Industry Charter and the Liquid Fuels Industry Charter. OEMs, their dealers and used truck traders confirm they have endless enquiries from interested parties that want to get into the business of trucking. The majority of these newcomers fail to qualify when applying for funds, especially for used trucks. “The last two years have been tough on small BEE operators who were affected negatively as a result of the tighter market conditions,’ says Elmarie Smith. More optimistic is Raymond Schulz who anticipates more activity as government spending comes on stream. This, he says, is evident from the improved performance when you compare month-on-month for January 2011 with 2010, a difference of 257%. Used truck traders are not happy with the reluctance banks have when it comes to granting credit, even when it is a truck with relatively low cumulative kilometres, is a popular make and model and is in good condition. Such vehicles still have a fair amount of useful life. Don Vale, the well known “Truckman’ and successful used truck trader for many years, says his experience suggests the lack of access to finance for used truck buyers has placed this vital segment of the market in deep trouble. Closing the door on retaining under-used trucks that are frequently successful in secondary distribution transport tasks may prove to be short-sighted. Constipation in the used truck sector ultimately results in much slower movement in new vehicle sales. To grow his business, Vale turned to selling his inventories across the border in neighbouring countries, some of which are starved for decent used vehicles. Honest used truck traders selling into these markets are usually paid in cash. From a general perspective, what should fleet owners and transport operators expect when applying for finance to acquire their trucks? Financiers need to be satisfied that the applicant has a viable and profitable business or undertaking capable of making the periodic payments for the duration of the agreement. Typically this would include a current, preferably audited, balance sheet, an income and expenditure statement and the status of creditors and debtors. In the case of applicants who transport goods for reward, the financier needs to review the merits of the contract(s) the applicant holds in order to assess the profitability, duration and sustainability of the work to be done. Depending on the amount of credit required as well as the financial strength and track record of the applicant, the financier will assess the risk it perceives if the application is approved. These assessments take into account the applicant’s access to regular and proper maintenance. Applicants without a comprehensive in-house workshop facility and trained technicians are advised to enter the OEM’s maintenance plan for at least the duration of the intended credit agreement. While not mandatory requirements, applicants who can show that their vehicles are properly maintained, are equipped with a credible tracking system and are driven by a trained and experienced legally licensed driver have a better chance of their application succeeding. Having provided such information that is acceptable to the financier, applicants can expect to pay a deposit of anything between 15% and 25%. The interest rate will be above the prime bank rate. The number of points above the prime rate will depend on the financier’s assessment of the risk. The duration will be 36 or 48 months dependent on the transport task and the choice of vehicle to complete the task. Periodic payments will be in arrears and there will be no residual value. Having said this, it is important to remember that each application is assessed on its merits. Where applicants require “tailoring’ of the agreement to meet their cash flow or other needs, this can be arranged by negotiation with the financier if the requirements can be justified and properly motivated. What information should newcomers expect to provide if they are to have any chance of succeeding? Newcomers do not have a track record and probably no previous experience. These are powerful reasons for financiers to say ‘˜no thank you’. However, there are many such situations that have succeeded. It is essential for newcomers to engage a properly experienced project or business manager, experienced in transport matters and with a good reputation. The business manager will assist the applicant to compile an acceptable business plan setting out the relevant facts financiers need in order to make an informed decision. The plan includes an assessment of the transport contract setting out details of loads, routes, work days, maintenance arrangements, billing and banking functions, registration for VAT, SARS and any other normal business requirements. Only after the financier has considered and accepted the application in full will a decision be made. If it is successful, the deposit, interest rate and duration may well be at a higher level to cover the risk which, in the first year depreciation, is at its highest. One of the problems is there is a shortage of competent and honest business managers. “Sadly, at the start up, newcomers agree to make use of a suitable business manager to secure the needed finance and then reject the assistance a few months into the operation. This has been one of the largest contributing factors resulting in small operators failing within the first 8 to 12 months of operation,’ says Elmarie Smith. Additional good advice from Elmarie reminds us that monthly payments are due within 30 to 60 days after the vehicle is delivered but income from transport contracts frequently does not flow in the first 30 to 60 days. Operators therefore need to ensure that they arrange sufficient cash flow prior to taking delivery of vehicles to bridge the “gap’. Raymond Schulz agrees that business managers are scarce and can add value but unfortunately, he says, the industry is sometimes targeted by the unscrupulous who run off with the entrepreneur’s money. Rolling back vehicle replacements results in huge unbudgeted maintenance and repair costs and loss of vehicle availability to do the work. Where’s your triangle, mister? Derek Moe, probably the most well known and successful manager of owner-driver schemes, says strictly controlled and managed systems must be in place to cover all the key functions of a small transport business if it is to be successful. This requires the ability to negotiate with principals, OEMs, banks and other suppliers in an open and transparent manner. “It is the only way to secure realistic rates and finance for clients that are sustainable for the duration of the contract and financial agreement,’ explains Moe. Financiers and OEMs are confident that access to funds will improve as the year moves on. This is expected to become more evident when the need to repossess slows down and the used traders and auctioneers manage to relieve some of the long held stock burden. 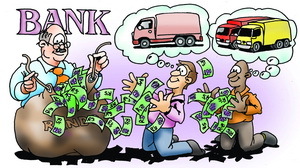 Historically, many financiers of commercial vehicles have, over the years, taken massive pain when the business models they chose did not deliver the goods. Perhaps this is mainly due to the lack of practical knowledge and experience of trucking that is prevalent among those who go out and about promoting their respective financial packages among retail truck dealers, brokers and other industry related entities. This is not peculiar to South Africa – it is widely identified in many other countries. Hopefully, as we move towards a new era in trucking that is already demanding much higher levels of transport productivity and efficiency along with the burden of meeting new emissions standards and evertougher competition – all of which will be daunting challenges for the most experienced truckers – financiers of trucks will gain a deeper understanding and appreciation of this vital industry. When this is so it will contribute positively to the growth and health of road transport and reduce the level of operator failures and consequent unwanted repossessions. FleetWatch thanks the financiers, OEM’s and others who contributed to this short overview of vehicle financing. May 2011 be a good year for all. The Industrial Development Corporation (IDC), which has been actively involved with providing funding mainly for BBBEE entrepreneurs entering the transport industry – largely in co-operation with Daimler Finance and ABSA – will withdraw from this market segment from April 1, 2011. From that date, the IDC’s focus will be on providing funding to the motor industry at the manufacturing level where further investment in developing local content is needed. The gap IDC focused on to assist entrepreneurs to get funding for vehicles will now covered by the new economic growth path initiatives. All truck tyres, accessories, tubes and flaps and treads will increase by 10%. All motorcycle and scooter tyres will increase by 8%. All passenger car tyres will increase by 7%. All agricultural tyres, backhoe and skid-steer tyres will increase by 7.5%. All earthmover, TP and industrial tyres as well as accessories will increase by 6%. According to a statement issued by the company, the price increases reflect the raw material escalations up to January of this year only and will take effect in South Africa on April 1, 2011.